As with several millennia of traders before him, Behroush Sharifi specializes in moving spices across borders — specifically fine Persian saffron. Before the embargo was imposed on Iran, effectively closing off his supply chain by executive order, the famed Saffron King established himself as the city’s premier purveyor of this distinguished spice. With the doors to trade now opened, Sharifi recently delivered his first post-embargo sampling to a chosen few of New York’s finest chefs. It is a pivotal moment for the man whose life has in large measure coursed with the political tides swirling through and around his nation of origin. Proceeds from the sale of this first kilogram, flown to Sharifi by close acquaintances, is the seed from which he is striving to build a new empire. In resuming this ancient intercontinental trade, he will also further his role as a cultural ambassador. “Being a human, it is your right to move freely around this globe. And it’s not just a linear movement, or a progression from point A to point B. Rather, it is a cross-cultural dialog. When you go from here to there you’re taking your ideas with you. You’re taking your recipes, your ingredients with you. And the minute you stop people from doing that…” From there Sharifi veered tangentially to the absurdity of constructing walls along national borders, but it’s not hard to complete his thought. Prevented from moving and interacting freely — exchanging spices and other goods along the way — our cross-cultural exchange of ideas and tastes is distorted. We are much more likely to harbor erroneous assumptions about those whose cultures or histories differ from our own. And, to reconnect with Sharifi’s tangent and resume our non-linear, cross-cultural dialog, it’s much easier to talk walls and razor wire when the populace is already culturally isolated. By engaging with the spice trade in a personalized, hands-on manner — much the way he and eons of predecessors have done — Sharifi is knowingly taking his place in one of the oldest cross-cultural dialogs on the planet. He is the now in an international practice that links past and future at a global scale. 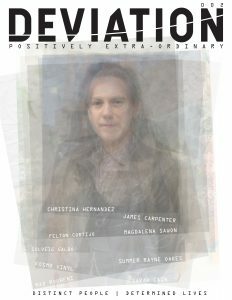 And with the embargo lifted, Sharifi is more now than ever. During Sharifi’s absence from the saffron trade the food movement exploded in America. Sourcing became a dominant concern for restaurant patrons and the quest for “local” reached a fevered, frequently unsound pitch. But we’ve crossed a threshold. Some of the strict mandates related to subjective catchphrases, such as local, artisanal, or farm-to-table, have proved their limits. Foodies are increasingly aware of these flaws as well, better recognizing the advantages of balancing local and global in our efforts to eat as sustainably as possible. This suits Sharifi’s business model just fine. His spices are hand selected in the majestic Tehran bazaar — a 22-kilometer network of shops and linked passageways. 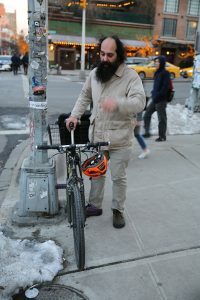 Upon arrival in the United States, foregoing trucks or automobiles, Sharifi makes his rounds on bicycle. While establishing his name among the finest kitchens in New York, the Saffron King also earned a certain notoriety for deftly negotiating the city’s streets with spice-packed panniers flanking his twenty-year-old Cannondale. Sharifi appears to take greater pride in having been twice profiled by the Bike Snob — whose blog frequently roasts the city’s cycling celebrities — than he does in being featured on the cover of Food & Wine magazine. If viewed in this comprehensive way, it would be hard to outperform the Saffron King’s farm-to-table network when judged by its artisanal balance of local and global merits.This local/global balance is fundamental to the ancient cross-cultural dialog that is international trade. It is the nexus that would arguably qualify trade as an art. Which leads to another all-American catchphrase: free trade. Despite espousing itself as the ultimate champion of “free trade,” the United States is not opposed to using sanctions as a tool for commanding obedience to US-dictated policies. This ability to weaponize trade — in the United States, Europe, or anywhere else — reveals the fact that all trade is contingent, not free. Eschewing the use of “free trade” as a catchphrase and accepting politically motivated contingencies as a matter of course, blunt refusal to conduct business with an entire nation is a highly destructive policy nonetheless. One that rarely achieves its intended aims, or does so at high cost. According to a recent New York Times article, “Nuclear sanctions might be lifted but almost all international banks continue to shy away from the Iranian market because of unilateral American regulations that label Iran as a state sponsor of terror.” These factors contributed to a situation in which the Iranian state outgrew its credit-strapped competitors. In an effort to stifle the nuclear weapons program of a “state sponsor of terror,” sanctions had the additional effect of undermining Iran’s private sector — results that do not vibe with our professed commitment to free trade. In lieu of swinging back and forth between all or nothing absolutes, it is perhaps more appropriate to view competing economic and political trade demands as a spectrum requiring balance and fine tuning. Catchphrases such as free trade or farm-to-table serve to run interference between the harsh realities of commerce and our perception of those realities. 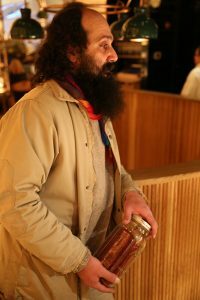 As a practitioner in the ancient spice trade, Sharifi has been forced to combat both lingoes — going toe-to-toe with the global politics of doing business with Iran while also having to respond to the local politics of delivering healthy, sustainably sourced ingredients to the city’s most exquisite restaurants. 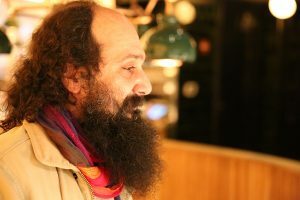 While food and spices were bundled with weaponized uranium in a nuclear arms dispute, Sharifi was forced to bend. Now that the geopolitical storm has slackened, the time has arrived for the Saffron King to, once again, stand up.